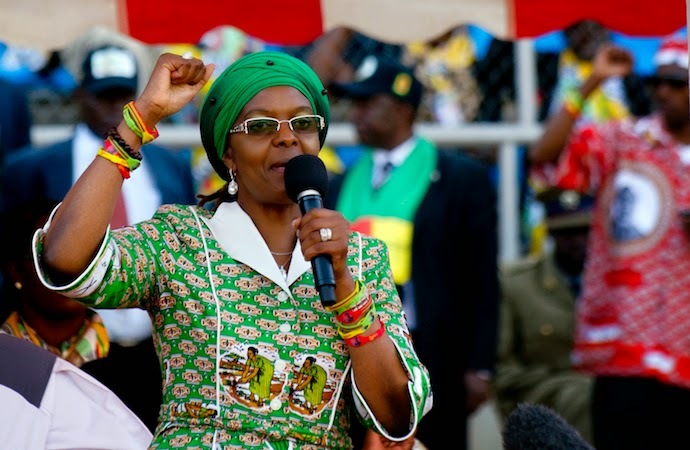 LONDON - Ever since she married President Robert Mugabe, Grace has barely been the darling of many. Her well-attended rallies seem to disguise a groundswell of dislike — judging by a slew of online comments unprintable here — which reached a crescendo after the award of a PhD to her by the University of Zimbabwe. The clashes in Mutare between Zanu PF supporters deepen factionalism in the party as much as illustrate some level of detestation for her from within. The Mutare youths openly questioned the Harare contingent, according to Zanu PF’s own pet media “why they were rallying behind her”. It also seems some Zanu PF (and perhaps Zapu) stalwarts too, though not expressing opinions publicly, harbour reservations about her rise to power. Margaret Dongo’s comments about Grace’s irregular elevation might be representative of the sentiment of veterans disenchanted by the meteoric rise of a former typist whose only claim to political fame is matrimonial association and the largesse of an obsequious party official. That Oppah Muchinguri relinquished her post to Grace is not so much of a surprise. Muchinguri will do anything to please the Mugabes — even, as she said some years ago, going to protest in streets, naked, if Mugabe was removed from power. It is bootlicking that delivers a meal ticket in Zanu PF. The outspoken Dongo lost hers for going against the grain. But her aspersions about Grace’s ascendancy are as legitimate as questions about the wisdom of arrogating her the onerous duty to end factionalism. Even Grace herself admitted she may be whistling in the wind. “What I am saying that factionalism should stop is not being listened to,” she said exasperatedly in Mutare. Indeed. It is doubtful that people who have not listened to her husband will now listen to a political upstart of little political pedigree and less endearing persona. It is apparent, nonetheless, from her meetings that Grace is attempting to portray herself as a credible leader, if not of the Women’s League alone, something “bigger”. Never mind her claims that she does not care about how she is portrayed, Grace is attempting to renovate her public persona. Her speeches have been more nuanced than just reckless drivel. A few themes can be teased out. To the church leaders, she attempted to project herself as God-fearing philanthropist as exemplified by her work at her orphanage. In her own words, it is “fall-back” work after her days at State House. This work, however, seems to have another objective she does not state. By selecting philanthropy which may result, in her estimation, looking after 400 orphans and disadvantaged children — she may provide herself with protective cover from potential persecution post-Mugabe and Zanu PF rule. Apart from philanthropy, she has also sought to project herself as unifier as demonstrated by her “mini unity accord” between feuding Zanu PF officials in Harare. At the same rally, she tried to present herself as forgiving as shown by her public pardon of a youth who had stated she had no place in Harare. Further, she has also sought to paint herself as compassionate by voicing concern over the demolition of illegal houses without alternative accommodation, and cautioning police against raiding women vendors. These statements seem to be a response to criticism that she has failed to act as mother of the nation. It also seems she has toned down personal attacks on MDC leader Morgan Tsvangirai. After all, such attacks would continue to make her vulnerable to retaliatory fire, and produce embarrassing reminders about the origins of her own marriage. In presenting herself as incorruptible, Grace cited her refusal to accept $10 million bribe allegedly offered so she could prevail over her husband on farm seizures. Put aside the coarseness, Grace is trying to rebrand herself. But it will be a Herculean task. At the moment, her critics do not seem persuaded that she has the dignity of a First Lady, the intellect of a PhD-holder and the gravitas of a national leader.